You will now be spending the next hour or so playing this. The instructions are in German, but basically you use the arrow keys to move the ball around (like Marble Madness) and the C key to “brake”. That ought to hold you until the great Joz returns. Let me take you back…wayyyy back to a time when I was still looking for my significant other. The days of Manila Nights and the time when being single really was all that there was for me. A few weeks ago, Yoshi’s mom brought down a suitcase for us to borrow. Yoshi just opened up a pocket and found two pairs of somebody’s dirty chones inside, and we are pretty sure they do not belong to either Yoshi’s Mom or Dad. I don’t know who else Yoshi’s mom lent this luggage to, but I don’t think I want to know. 56 More Reasons of Why I Love Yoshi! It’s a known fact that I have a thing for pens. 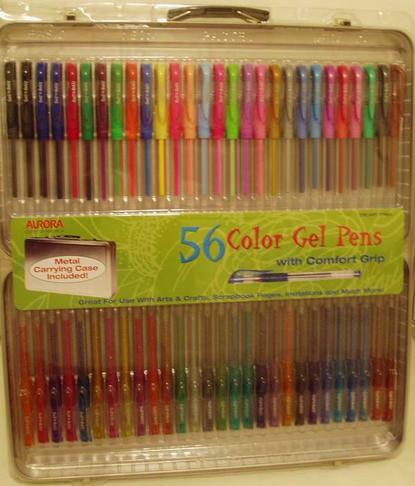 Especially nice pens which write smoothly and come in a variety of colors and styles. But I basically love writing utensils in general and have amassed large quantities of them to the point that I have been specifically banned from purchasing/bringing home any new ones. Anyway, today I had a yucky time at Costco because I went to pick up some photos and they weren’t in the bin where they were supposed to be. They were also not in the bin under the letters A, P, E, F, G, H, R, S, T, or L. Since I gave up film, I haven’t had much opportunity to develop photos at Costco, but now I remember why I hate leaving things to be developed there. The nice guys at Costco were able to run the envelope # and know that the photos had not been paid for by someone else (which is what happened the last time I developed photos at Costco) and were somewhere in the bins. Needless to say, it took quite a while to go through all those letters. I ended up giving up and was very dejected. I called Yoshi and asked if I could pretty please buy a new set of gel pens (which came in their own metal carrying case) and with a little bit of charm (whining), Yoshi was nice enough to let me come home with them. It certainly made my day! The jozjozjoz.com archives for Friday, July 16th, 2004.